Monthly data was light this past week. Factory orders for October were down -0.4%. This series has gone flat for the last 3 months. 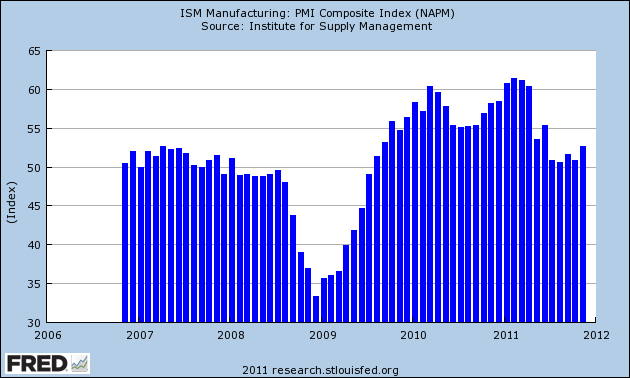 The ISM non-manufacturing index also softened, but remained positive. The University of Michigan's preliminary December consumer confidence report was up more than expected. The expectations index, one of the 10 LEI, was up sharply, having regained over half its loss from July's debt ceiling debacle. The high frequency weekly indicators are at the point where holiday seasonality strongly affects their week over week performance. YoY comparisons are more important, but whether those comparisons are improving or deteriorating is most important. Most of these indicators again showed strength, with the exception of tax withholding, money supply, and gasoline usage. I again remind new readers that my "Weekly Indicators" column is not designed to be a big picture forecast of the future, but rather by use of high frequency data to capture an up-to-the-minute snapshot of the economy as it is right now. As Matt explains, "It was clearly running ahead last year, and has been neck-and-neck this year, due to the tax cut of course. In September and October, the dips in the 2011 line were consistently above the 2010 line, though you have to squint to see it. Since November, the lines are neck-and-neck again." More graphs and information about withholding tax receipts are available at his site. For the second week in a row, YoY weekly median asking house prices from 54 metropolitan areas at Housing Tracker were positive, up +0.1% YoY. The areas with YoY% increases in price increased by 1 to 21. Only Chicago continued to have a double-digit YoY% decline. Retail same store sales were decidedly mixed, as one service reported the lowest YoY gain all year. The ICSC reported that same store sales for the week ending December 3 increased 3.8% YoY, and 2.3% week over week. Shoppertrak, however, reported that YoY sales rose a mere 0.2% YoY and were off a huge -22.5% week over week. Weekly BAA commercial bond rates increased .17% to 5.18%. Yields on 10 year treasury bonds increased less, up .10% to 2.04%. In the last few weeks, spreads have widened again, representing increasing weakness. Money supply has been flat or down since its Euro crisis induced tsunami of several months ago. M1 increased +0.1% last week, and was unchanged month over month. It is now up 17.9% YoY, so Real M1 remains up 14.3%. This is about 6% under its peak YoY gain several months ago. M2 was unchanged both w/w and month over month. It remains up 9.4% YoY, so Real M2 was up 5.8%. This is also significantly less than its YoY reading at the crest of the tsunami. The overall picture continues to be an economy that is expanding again after its summer stall, but the recent stagnation in money supply and $100 Oil are indicative of strong headwinds going forward. The large drop -- over 20,000 -- this week makes me suspect there may be a little bit of an overshoot at work. Don't ignore the number. If there is an overshoot it may only be 5,000 or 10,000. But take this number, and the numbers for the next month or so, with a little grain of salt. Below are charts of major market ETFs. Notice that all are currently in some type of consolidation trend, meaning most of the equity market's sectors are also consolidating right now. Over the last few days, I've expressed concern about the rally in the markets, largely because the overall price action has been weak and the volume low. Yesterday's action confirmed my concerns with the market printing an extremely poor day. Prices have moved through the upper trend line of the consolidation triangle. The above chart shows that after a decent rally, prices stalled in the 125-127 price area. However, yesterday, prices moved lower, breaking support. Prices gapped lower at the beginning of the session and continued to move lower throughout the day. They rallied into the 20 minute EMA, and attempted to move through the 50 day EMA, only to fall into the close on increasing volume. 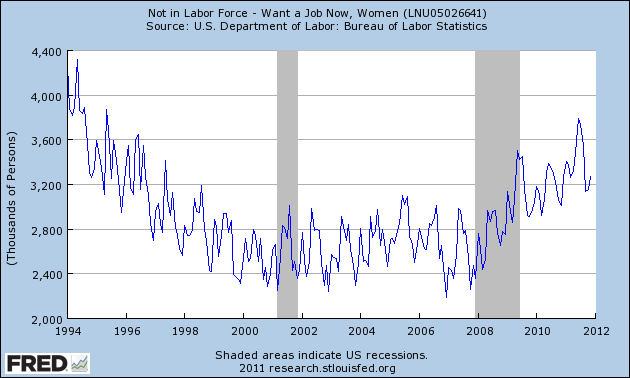 What Does "Not in the Labor Force" Mean? There is a good and bad point about the internet. It has greatly increased the number of people who can write and provide opinions about things. This is also bad, as there are a lot of people out there who have no idea what they're talking about. Case in point: Friday's jobs report and the 487,00 increase in the number of people "not in the labor force." To the average commenter -- the one who doesn't bother to look up what this term means to the BLS -- this means all those people gave up looking for work, indicating the economy is in fact terrible. However, that's just not the case. Employers think they are too young or too old, or they face some other type of discrimination. According to the latest employment report, the civilian non-institutional population was 153,883,000 (which is the total number of people employed and unemployed) while the total non-institutional population was 240,441,000. This means there are 86.558 million people who are not in the labor force. 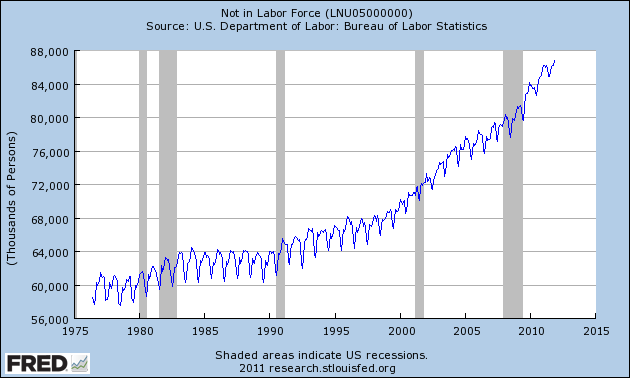 The above chart is the total figure for "not in the labor force," not seasonally adjusted. Notice that this number has been slowly creeping up since the end of the 1990s. Put another way, the increase is hardly a new development, and probably has something to do with the aging baby boomers. The above two charts show the number of men and women not in the labor labor force who want a job now -- this is the category that many people are talking about. Notice that we're actually talking about 6 million people in these charts -- or about 7% of the total amount of people who "aren't in the labor force." 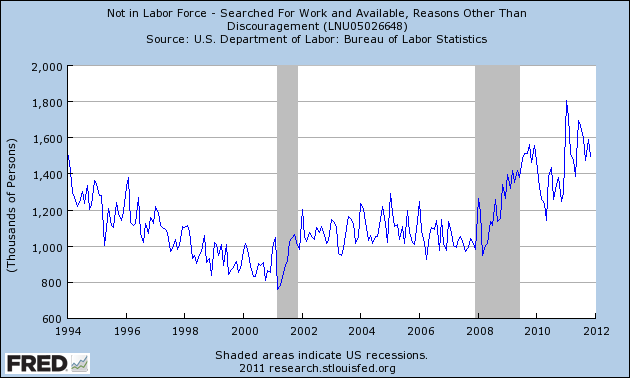 The above chart is the people "not in the labor force" but have searched for work and are available. Notice this number is about 1.675 million -- with is a little under 2%. The BLS phrase, "not in the labor force" is a statistical term; if you're going to use it, it helps to first understand what it means. The vast number of people who are using the term are doing so for political reasons -- without clearly understanding the term. 1.) Not in the labor force is a statistical measure, and is primarily comprised of retirees and students. 2.) Labor under-utilization -- which is what most people are concerned with when it comes to this statistic -- actually represents less than 10% of the "not in the labor force" number. And no, I am not trying to make light of the plight of the unemployed. However, it's also important that we understand the terms and definitions we're using in order to properly discuss what we're talking about. This morning the WSJ has an article entitled Demand for Temp Help Cools including a graph of the YoY% change in the American Staffing Association index. This note was picked up by Mish, who furthers the analysis by including the American Staffing Association's graph of its staffing index beginning July 1, 2006, highlighting that the index has been lower YoY since mid-August. Since this index is a component of my "Weekly Indictors" needless to say I am familiar with this data. While the data cited by both is accurate, the interpretation is misleading in the case of the WSJ, and Mish misreads it. 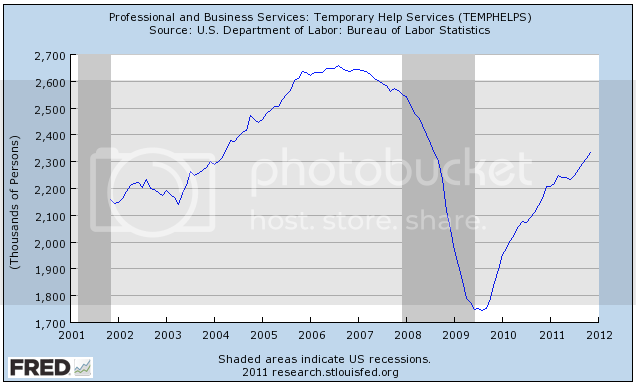 Note that temp hiring peaked about 18 months before the recession began, and bottomed in late 2009 about 6 months before the bottom in employment generally. Secondly, note that this number briefly declined earlier this year and has since resumed its strong advance. 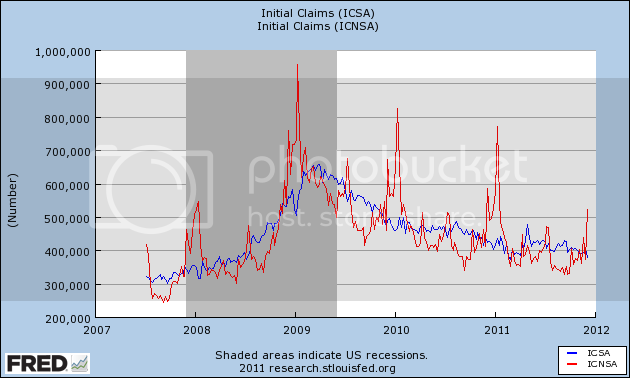 Simply put, temporary help in no way supports a claim that we are on the cusp of recession. 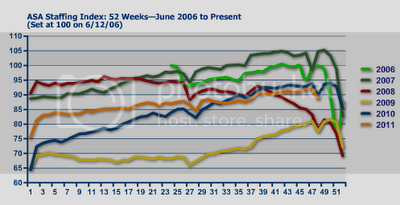 Since week 33 (mid-August), demand for temporary and contract help is below where it was for the same week in 2010. Although 2011 is substantially better than 2008 and 2009, it is now lagging 2010 and considerably lagging 2006 and 2007. ... [C]onsider the possibility employers are slowly dumping temps and contract workers, and permanent employees may be next. Mish's analysis would have been spot on a few months ago during the summer employment stall, but is no longer true. Just as the ASA index's late 2009, 2010 and early 2011 readings were also "lagging 2006 and 2007", but still improving, meaning that temp services were increasing, so now even though November's readings were slightly below last November's readings, the index is increasing again, and indeed the YoY comparisons, while still negative, are slowly improving as well. To repeat: the ASA temp service index is simply not now signaling a recession. A long time ago in a galaxy far, far away, Mish did some great work. And he's still capable of doing that work. However, at some point in the last few years he because drunk with success and enthralled with his own political agenda. At this point, he became utterly useless as an economic analyst. Hey folks -- this is Bonddad and I need some advice. My wife and I are picking out Christmas gifts for my nephew. He's got an econ degree for UT and is a part owner in a business just north of San Antonio. He's very sharp from a money perspective, so I wanted to get him a good book on the markets. Basically, he's got the raw knowledge, but I think it's the application of it that would be the most benefit. One of the ways that I learned about economics and the markets was to read these interviews, because it showed me how other people practically applied their knowledge. Anyway -- does anybody have a preference -- or other recommendations? Over the last few days, I've expressed concern about the strength of the stock market's current rally. Yesterday only added to my concern. The top chart shows the daily chart, which is still moving sideways. Yesterday's price action merely lowered the consolidation range to 125 from 125.5. The TLTs are right at long-term support. For a move lower to be significant, we'd need to see a move below at least 116. Looking at the technicals, we see a strong inflow in the form a a risking A/D and CMF. But we also see declining momentum in the lower MACD. Normally, I'd be more inclined to rely on the volume metrics. But, remember that long-term prices are near historically high levels. With the temporary lull in dramatic (US) economic direction, I have been updating a number of metrics I haven't looked at in awhile. 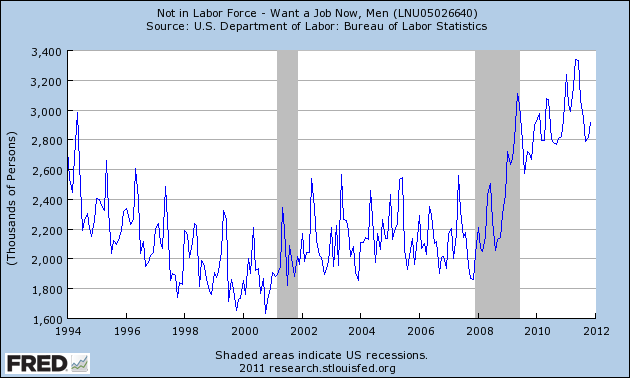 Two weeks ago, I looked at leading indicators for jobs. Last week I examined real wages and the savings rate. This week I'm revisiting state tax receipts. These lag the economy, and reports on state tax receipts badly lag even that. Because I knew they would turn up after the other data already had, I used to pillory Mish about sales tax receipts in particular. Needless to say, Mish, who used to religiously report these, stopped after they unequivocally turned against him. With last summer's near stall, however, in real terms these seem to have stalled as well as of the most recent (summer) reported data. The Census Bureau has reported on state and local tax revenue collected in the second calendar quarter of 2011, and the Rockefeller Institute has also reported on preliminary collections from the third quarter. [Further, p]reliminary figures for July and August 2011 suggest continued, though less robust, growth in revenues. Overall collections in 41 early-reporting states showed average gains of 6.8 percent compared to the same months of 2010. Even for states, the longer term revenue picture remains mixed. Despite the recent gains, states' tax revenues remained lower in the second quarter than they were four years earlier. Tax collections for local governments, meanwhile, have headed in the opposite direction. The second quarter of 2011 marked the third consecutive quarter of declines in local property tax revenues. In total, local property taxes declined by 1 percent in the second quarter of 2011 compared to the same quarter of 2010. In summary, while in nominal terms state tax revenues have made back all but less than 4% of their entire shortfall off peak pre-recession revenues, measured in real terms they have stalled in the last several quarters. Meanwhile population has increased, and states have been facing record unemployment payouts. As I've said before, while there has been strong improvement, it still hasn't been enough. Even worse, local governments, which rely on property taxes, are suffering from decreased revenues as well as decreased aid from the states. If ECRI's prediction of another recession in the immediate future does turn out to be true, it is going to be brutal for state and local governments. 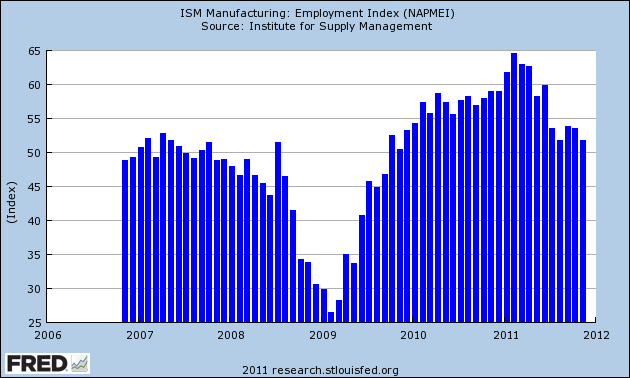 Yesterday, I wrote about the latest ISM manufacturing report. The above chart shows why I think this is an important data series. I've compared the ISM monthly index to the year over year percentage change in GDP. Notice that the data series follow each other pretty closely. It's not an exact match, but there is some similarity. 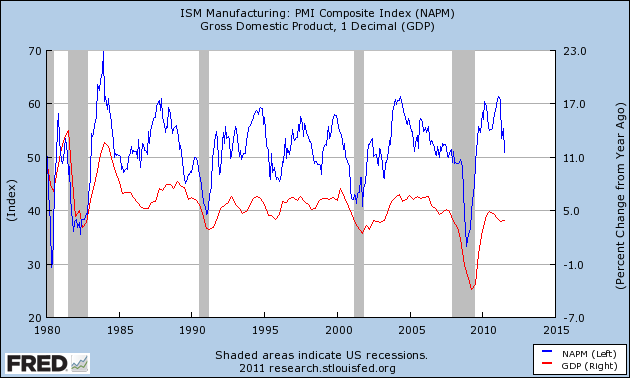 The above chart is the ISMs new orders index and the YOY percentage change in GDP. The relationship here is a bit weaker, although it still exists. For example, notice the big jump in new orders coming out of the 2000 recession that wasn't followed by a bug jump in GDP. 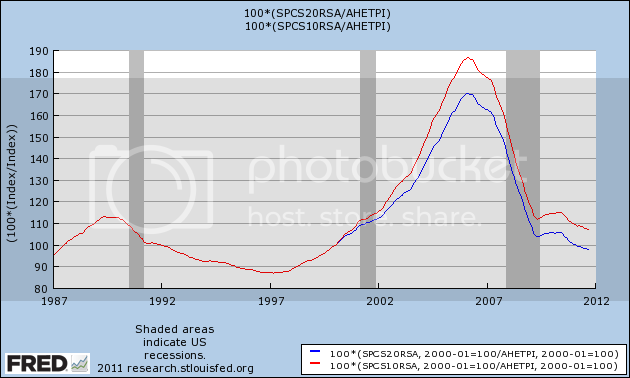 However, the relationship did exist coming out of the early 1980s and 1990s recession. 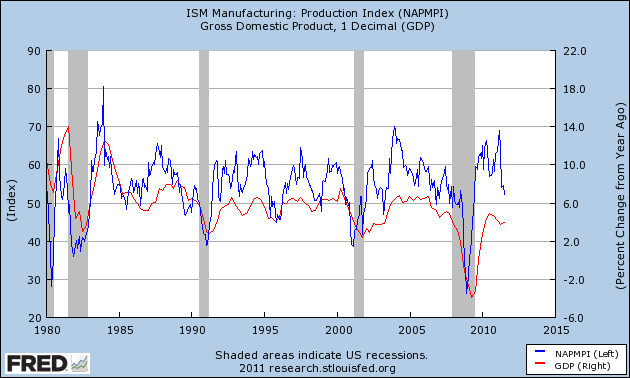 The above chart is the ISM's production index relative to YOY GDP. Again, we see a general correlation. 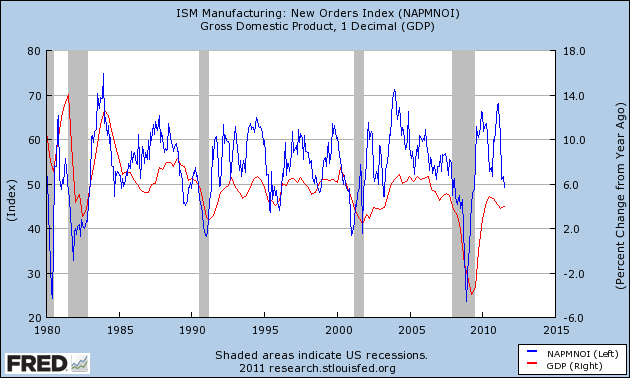 The above charts indicate that the ISM is a decent, coincident indicator of GDP. The SPYs price action over the last five days explains my concern about its supposed "break-out" from a consolidation pattern. Prices gapped higher and then moved higher for 2 and a half days. Prices broke trend on the third day of the rally and have been consolidating for the last two days between 125.5 and 127. While prices are still above the 200 minute EMA, this is a rally whose steam is running out. We see the same pattern play out in the other averages -- prices broke out but did so on low volume. In addition, none of the bars are green, indicating prices closed higher at the close. As break-outs go, these are really terrible. 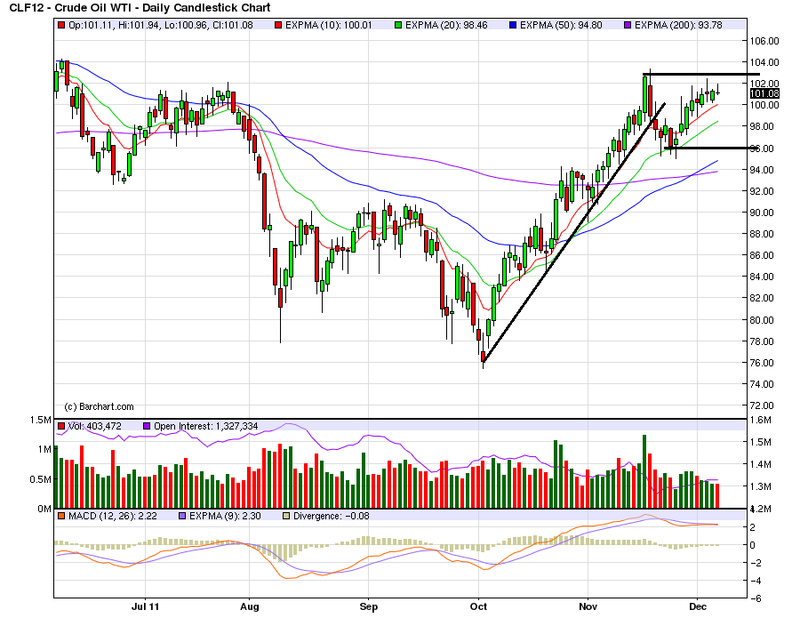 Oil prices continue to consolidate. Key prices levels to watch for are 102.75/103 and 96. Two months ago I wrote that It's time to admit that house prices have stopped falling. 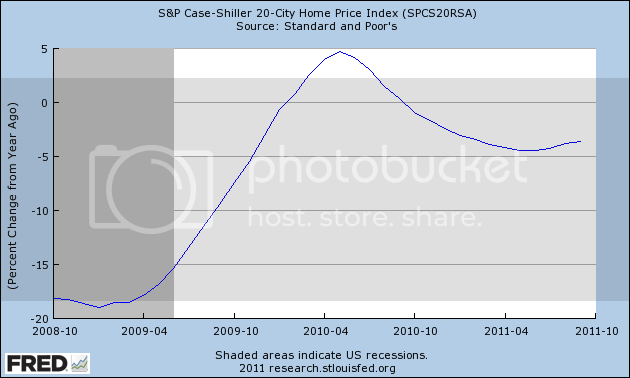 November's housing price data rendered a split decision on that forecast, as asking prices from Housing Tracker confirmed a bottom, while data of repeat house sales in Case-Shiller contrarily did - finally - make a new low under their March 2011 level. While the Case Shiller indexes report comparable sales prices, Housing Tracker reports asking prices in 54 metropolitan areas. I follow these because they showed the peak in the housing market at the beginning of 2006 before the Case Shiller sales prices did, and because since then they have led trend changes in the Case Shiller reports by about 4 to 6 months -- which makes sense, since houses are put on the market with asking prices months before they go under contract. Housing Tracker's weekly YoY comparisons for November are instructive: in order, they were -0.9%, -0.5%, -0.3%, and +0.1%. December will tell, but it appears that the turning point has been reached. Keep in mind that even after a nominal bottom in housing prices, there is likely to be an extended period where they are still declining in real, inflation-adjusted terms. Prof. Shiller himself believes another 15% or more decline in real terms is likely, and I do not have any reason to disagree with that. 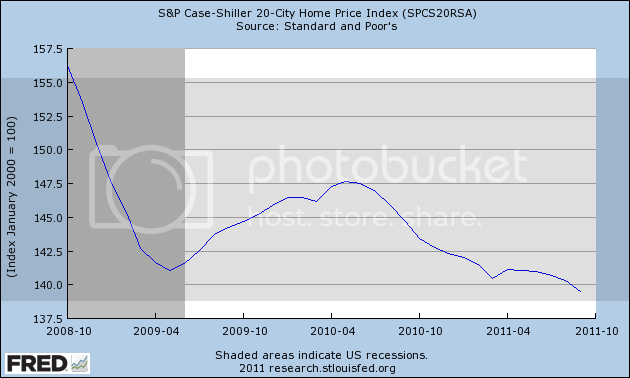 The discrepancy between the Case Shiller and Housing Tracker reports will get resolved one way or the other. 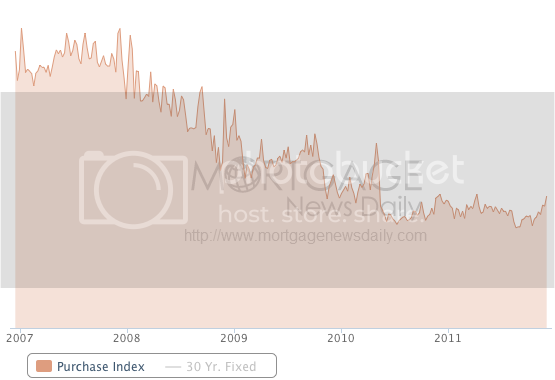 I continue to expect Housing Tracker to be the leading series. In that regard, Bill McBride a/k/a Calculated Risk has noted that typically price inflection points are reached at about 6 months' housing supply -- more than that means declining prices ahead, less than that means rising prices ahead. As of the October housing sales reports, new home supply is at 6.3 months and has been declining at a rate of 2 months per year for the last several years. Existing home supply is at 8.0 months, and while the trend was distorted much more by the housing credit, recently inventory has been declining at a -10% YoY rate, which has also coincided with a rate of decline of 2 months' inventory per year. If those trends continue, then within a year both will be under 6.0 months and under CR's metric, we should expect housing prices to be increasing. There are a few odd points to mention. First, of 18 industries that are reporting growth, 9 are reporting a slowdown while 8 are reporting growth. In addition, five industries are reporting new orders growth while 6 are reporting slowing growth. This means that pace of growth in the expanding industries is higher than the pace of decline in the slowing industries. Note that most of the information above is positive. Manufacturing activity grew at a steady pace across most of the country, with all Districts other than St. Louis reporting increases in orders, shipments, or production. Chicago, St. Louis, and San Francisco reported positive results in metals and fabrication, while Cleveland saw flat steel production and Philadelphia noted decreased demand for primary metals. Cleveland and Chicago reported increased auto production year over year, but Boston noted signs of slower auto component production. Dallas saw steady demand for electronics, computers, and high-technology goods, but San Francisco reported that demand for consumer electronics continued to decrease. Philadelphia, Cleveland, and Chicago saw increased production of energy-related products. For construction-related goods, Chicago and Minneapolis reported declining demand, while Dallas said demand was stable. Overall, St. Louis saw more plant closures than plant openings or expansions. 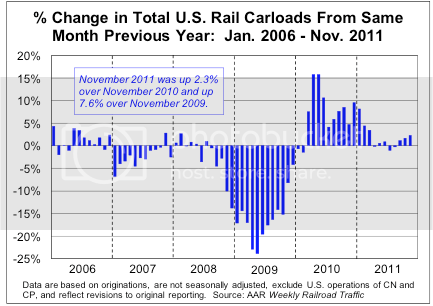 Freight transportation volumes increased in Cleveland, held steady in Atlanta and Kansas City, and were mixed in Dallas. Although the composite number dropped to just above 50, the latest reading gives us some "breathing room." 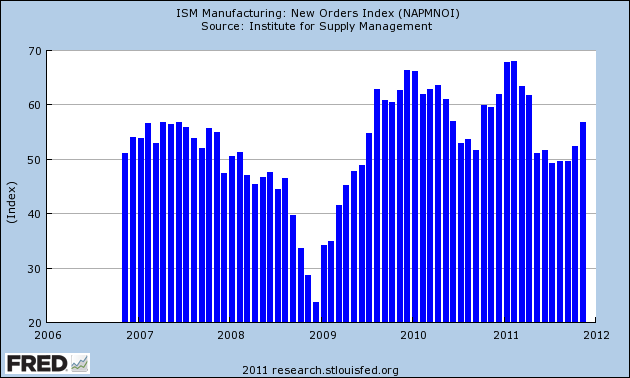 Although new orders are skewed (see above) the overall print is strong. 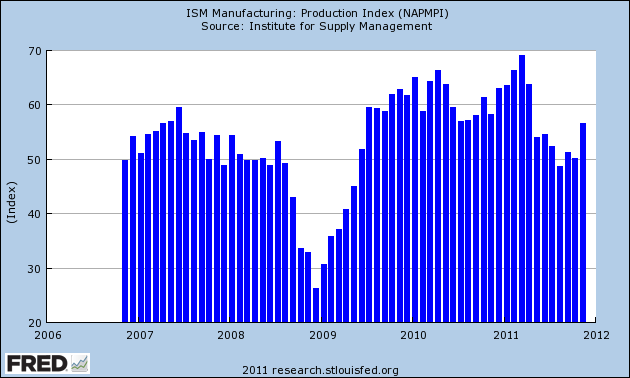 The overall production index is also shows a good print. However, the employment number is still weak, although it does show slight expansion in this area as well. Over at the Big Picture, Barry asks a good question: do ratings agencies still matter? No. Watch the bond and currency markets to see what the market really thinks. The above charts are all the major indexes I track with the exception of oil. The treasury market, gold and the dollar are all clearly in a consolidation area and while the equity markets have technically "broken out," their respective break-outs are extremely weak, indicating they are probably false break-outs. Remember, markets can move either vertically or horizontally. Ideally, we want them to move vertically because then we can make bets on the length and strength of the move. While we can still place bets (make trades) when prices move horizontally, it's a much harder game to plan. 1.) The fundamental news hasn't changed in a meaningful way over the last 6 months. The US economy is growing, bit slowly. Europe is just this side of a meltdown; Asia is still growing, but they are growing more and more cautious given the macro situation. In short, it's the same old song and dance. In short, the markets tell us we're in the middle of economic stasis, which we more or less are. 2.) At the same time, the markets currently tell us that safety is very important (the high price of treasuries), there is still inflationary concern (the high price of gold), the US is still weak (the low position of the dollar) and the US economic rebound is in question (US equities). 3.) There is also some end of the year portfolio management going on. Managers who had big gains are holding on to the last possible minute to sell to make sure they've locked in their gains for year.